"Life is Good at the Beach" when you stay at this 4 bedroom, 4.5 bathroom home. 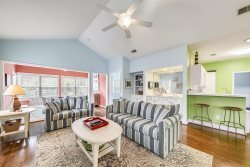 Steps from the beach this finely decorated escape is the perfect vacation home for your whole family. The great room of this home is spacious with high ceilings and wood flooring. Cozy up on the navy sectional sofa for a game night or movie with the family. The area features a raised TV/DVD/VCR, framed by decorative white wood shutters. An elegant kitchen nook has a wood table with seating for 6. The open kitchen has plenty of counter room or all your culinary needs. "Live, Laugh, Love" is the theme of this master suite (#1) with a King-size bed. Yellow and blues colors balance antique wood furniture to fill the room. The spacious bathroom has a double sink vanity area with private bathroom including a walk-in shower and bath. Downstairs you will also find a full laundry room and half-bathroom. At the top of the stairs is a loft area with a sleeper sofa (Double) and a TV. The first bedroom (#2) has a King-size bed with a teal, brown, yellow and green bedspread. A private bathroom with bath/shower is at your disposal. The next room (#3) is warm and soft, with sunny walls and colorful spreads. It has two queen-size beds. Enjoy the armoire stored TV/DVD and private bathroom with bath/shower. The final bedroom (#4) is colorfully done and will be a delight for kids and young adults with two bunk beds, each with a Twin on top and Full on the bottom and striped quilts. There is a private bathroom with bath/shower. The Lyons complex in Port Royal Plantation is a small group of spacious, duplex townhomes clustered around a landscaped green area. This common area features a large pool, and individual grilling areas in front of each townhouse. A short 4 to 6 minute walk on a paved pathway leading down to the beach featuring a beach house with rest rooms and a playground for the kids. All beach distances are measured from the center of the complex. Tennis courts available through the Port Royal Racquet Club for a fee. A very nice and welled cared for property. Would loved to have been able to spend more time there. Would like to come back to the area another time. Next time we will rent bikes. Very nice place, we had a great time! Loved it - wonderful condo and location. We took 4 teenagers with us who enjoyed themselves to the highest and made wonderful memories! Thank you! Hope to stay there again as it was wonderful! It was a great place to stay and we enjoyed our time there. We had an exceptional time with our family. Great house. We are a family of 6 and it had everything that we needed.